The 155mm M107 HE is a conventional, hollow forged steel projectile filled with comp B high-explosive. 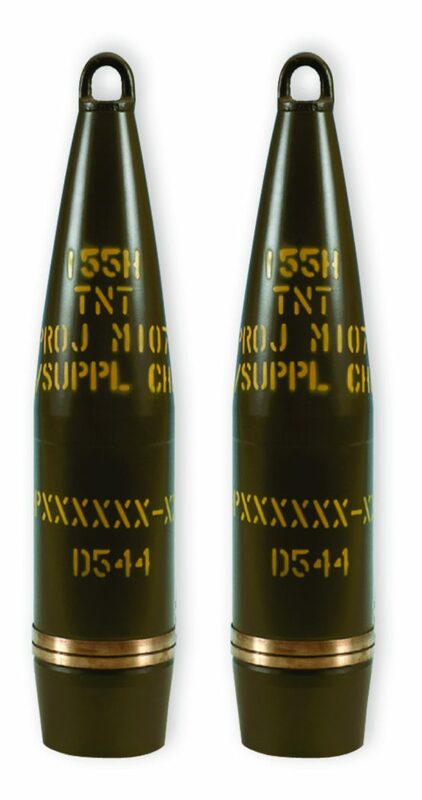 A supplemental charge may be fitted to projectiles loaded with a deep intrusion fuze cavity and is removable. Fuzes such as the M739 series can be assembled to the projectile. A swagged gilding metal rotating band encircles the projectile near its base. The rotating band is protected from damage during shipping and handling by a composite grommet which is removed before firing. A threaded, lifting plug closes the fuze cavity to prevent damage to the threads during handling and storage.